New research suggests our galaxy contains as many as 100 billion brown dwarfs—a type of celestial object that didn’t have quite what it takes to become a full-fledged star. The finding shows just how ubiquitous brown dwarfs really are, and how many false starts are involved in the formation of new stars. 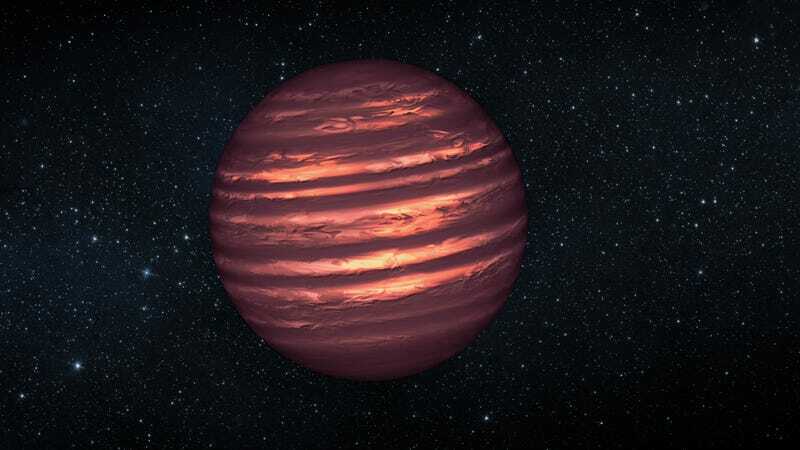 Brown dwarfs exist in a hazy area of astronomy. They’re too hot and big to be planets—about 15 to 80 times the mass of Jupiter—but they’re too small to be stars, lacking enough mass to sustain stable hydrogen fusion at their cores. Brown dwarfs are a result of processes that normally lead to the formation of stars, so they’re often referred to as “failed stars.” Harsh, but that’s astronomy for you. Back in 2013, astronomers started to get an inkling that brown dwarfs are a fairly common fixture of the galaxy, offering a ballpark estimate of 70 billion. But a new analysis presented today at the National Astronomy Meeting at the University of Hull is claiming to offer the most accurate census figure to date, a revised estimate of 100 billion. Given that the Milky Way contains anywhere between 100 to 400 billion actual stars, this finding implies that our galaxy is littered with these free-floating failures. To date, astronomers have spotted thousands of brown dwarfs, the vast majority of which are located no further than 1,500 light-years away. These objects are very faint, making long-distance observations difficult, if not impossible. Most of the brown dwarfs we know about have been detected in nearby star forming regions known as clusters. One such cluster is NGC 133, which features half as many brown dwarfs as stars. That figure seemed unusually high to Aleks Scholz from the University of St. Andrews and his colleague Koraljka Muzic from the University of Lisbon. To get a better sense of the brown dwarf formation rate within clusters of varying star densities, these researchers embarked on a search of brown dwarfs in a more distant, far denser star forming region known as RCW38. To view this distant cluster, which is located 5,000 light-years away, the astronomers opted to use the NACO adaptive optics camera on the European Southern Observatory’s Very Large Telescope. Like previous surveys, they found half as many brown dwarfs as stars, implying that the formation and frequency of brown dwarfs has very little to do with the composition of star clusters. That huge number could be as high as 100 billion, extrapolating from the researchers’ observations of the entire galaxy, and by assuming a higher rate of star formation in the Milky Way’s past. But that estimate may be on the low side, given that many more fainter brown dwarfs probably went undetected. It’s important to point out that this paper has yet to appear in a peer reviewed science journal (a pre-print can be read at arXiv), so we’ll have to take these findings with a grain of salt. That said, John O’Meara, an astronomer at St. Michael’s college who wasn’t involved in the study, says this figure is plausible. And by comparing brown dwarf formation in two very different clusters—one with a low density of stars and one with a high density—the researchers demonstrated that the stellar environment isn’t necessarily a factor that regulates the ability of a star forming region to produce these objects. “Brown dwarf formation is a universal part of star formation in general,” said O’Meara. Professor Abel Méndez from the Planetary Habitability Laboratory, another astronomer who wasn’t involved in the study, says the numbers in the new paper make sense given that smaller stellar objects are more abundant in the galaxy. On the downside, the preponderance of all these failed stars is not good for the prospects of alien life. Méndez is doubtful that brown dwarfs are stable enough over the long term to maintain any semblance of habitability. O’Meara’s suggestion was to replace “failed star” with “well motivated but just can’t do it,” but he admitted that’s a bit of a mouthful. At the end of the day, whether brown dwarfs are failed stars or not comes down to your own ontological take on the purpose of the universe.